The author of the monument is the great French sculptor Etienne Falconet. He worked at the monu­ment for 12 years. Peter I was presented here not as a military leader but as a legislator, benefactor of his people. Falconet worked on his sculpture intensively and selflessly. The best horses in the royal stables were placed at his disposal. Falconet copied the move­ments and the poses of the rearing horses, the tense­ness of their muscles. One of the generals posed for the sculptor. 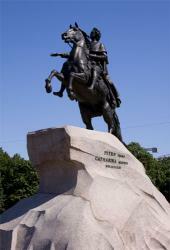 He was similar in height and figure to Peter the Great. Fal­conet’s pupil Marie Collot created the head of the rider. She took a portrait by B.C. Rastrelli as an ex­ample. The Russian sculptor Fyodor Gordeyev moulded the snake. The granite block for the pedestal was found in the village of Lahta. The legend says that Peter often climbed this rock to survey the environs of the new city. It was very difficult to deliver the 1,600-ton monolith to St. Pe­tersburg. An unknown Russian blacksmith found a brilliant solution. He proposed to raise the rock by levers. The rock was mounted on a platform of logs and rolled on copper balls along the rails with grooves to the shores of the Gulf of Finland. Then a specially constructed barge delivered it to the square by the Senate. It took about 2 years to transport the rock to the city. The monument was inaugurated in 1782. On both sides of the pedestal the inscription in Russian and in Latin are with superposed bronze letters : « To Peter the First — Catherine the Second. The year 1782”; “Petro Primo Catarina Secunda MCCCXXXП”. The poet A. Pushkin called it “The Bronze Horse­man” and converted it into one of the characters of his poem.